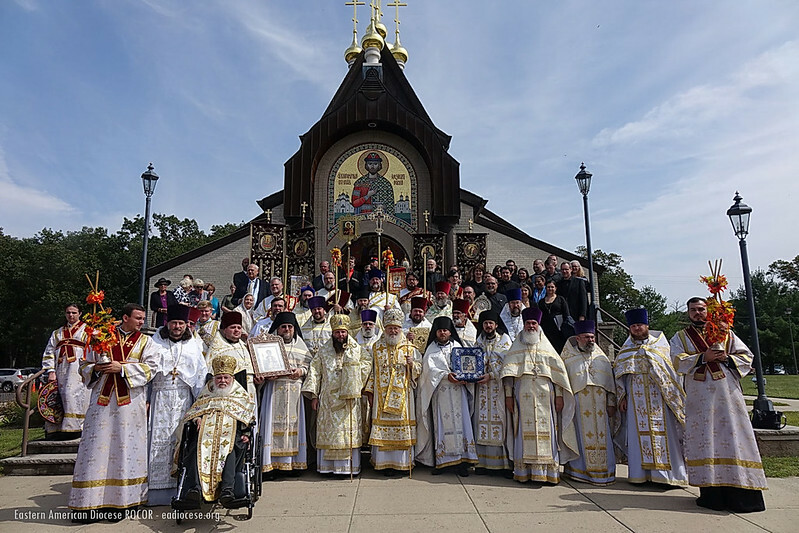 Members of the Cossack Congress in America participated in the celebration of Saint Alexander Nevsky patron of Saint Alexander Nevsky Diocesan cathedral in Howell, New Jersey on September 12th, 2017. Present members of the Cossack Congress in America were Kuban Cossack Voisko Abroad (Howell, New Jersey) and Stanitsa Nikolskaya (Chester, PA). Metropolitan Hilarion of Eastern America & New York led the Divine Liturgy co served by Bishop Nicholas of Manhattan and a multitude of priests. The faithful were able to venerate the myrrh-streaming Hawaiian-Iveron Icon of the Mother of God that was visiting the parish on this celebratory occasion. The Cossacks held an honorary guard at the myrrh-streaming icon and afterwards participated in the procession as standard-bearers. The Divine Liturgy was sung by a choir of PaTRAM singers under the direction of Maestro Dr. Peter Jermihov. Upon the conclusion of Divine Liturgy, the Cossack honorary guard escorted the myrrh-streaming icon along with Metropolitan Hilarion and Bishop Nicholas to the church hall where a luncheon was organized for the clergy, choir, parishioners, and guests by the cathedral sisterhood.